Does government spending by age reflect a commitment to early intervention? The growing research consensus is that intervening early in children’s lives is key to their future well-being. Programs such as Head Start aim to positively influence children’s development early on and lessen the chances of difficulties later. But on a larger scale, how much does government actually invest in young children compared with older children? When we look at many forms of spending, not just early care and education programs, what do the numbers reveal about government’s priorities for children? Our recent Kids’ Share analysis helps answer this question by examining government spending on children by age. We find that in 2011, federal per capita expenditures—including both direct spending from federal programs (outlays) and reductions in tax burdens—were highest for infants and toddlers, age 0–2, ($6,578) and shrank as children entered older age groups (ages 3–5, 6–11, and 12–18). One reason for this pattern is that young children, who tend to have younger parents with lower wages, have higher poverty rates than older children—25.3 percent of infants and toddlers were below the federal poverty level in 2011, compared with only 18.5 percent of secondary school-age children. As a result, they receive a disproportionate share of federal safety net programs such as Medicaid and the Supplemental Nutrition Assistance Program (SNAP, also known as Food Stamps), especially during a recession. Medicaid spending is particularly targeted toward younger children, totaling $1,792 per infant or toddler—about double the program’s spending on each of the other age groups. Focusing only on federal spending, however, offers an incomplete picture. When we also look at how much state and local governments spend on children, we find that school-age children receive a much larger share of state and local spending than infants and toddlers. In 2008—our most recent year of state and local spending estimates, and one in which the pattern of federal spending by age is similar to that of 2011—states spent over $10,000 on each elementary or secondary school-age child, but only about $1,300 on each infant or toddler and about $4,600 on each preschool-age child. The majority of states’ spending was on public education, which usually doesn’t begin until age 5 or 6 and is largely funded by the states. This presents a practical barrier to early intervention: if the largest avenue through which government serves most children is public school, and the youngest children do not attend school, how can we serve them? 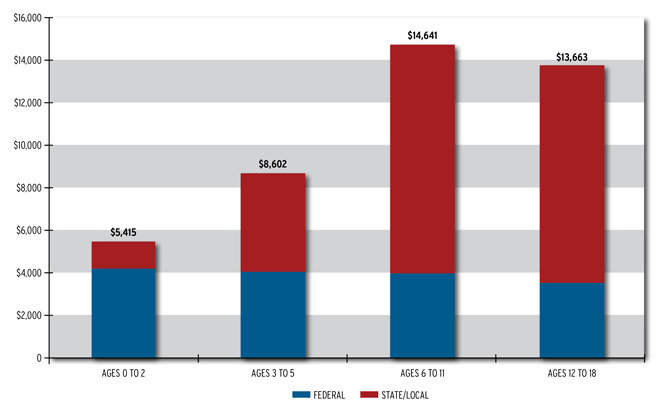 Should the federal government invest even more in children under age 5? Or is the distribution of total government spending, at all levels, fine as it is? This report cannot answer these questions, but it does show that the fiscal health and funding decisions of all levels of government matter when it comes to investments in children.